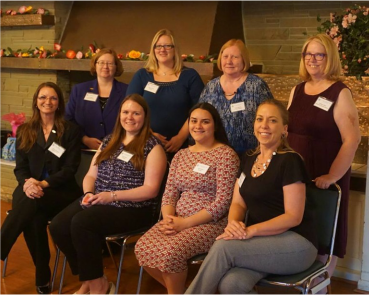 The Mesa East Valley Chapter of the Accounting and Financial Women’s Alliance was recently recognized with a national Chapter Achievement Award in the category of Communications. The Mesa East Valley Chapter celebrated 30 years of education, networking and leadership during the 2016-2017 board installation. Special recognition went to charter member Dorothy Ashley for achieving 30 years of perfect attendance at chapter meetings. 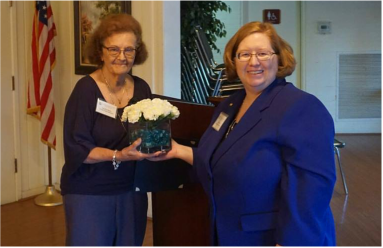 Dorothy was presented with her certificate and engraved vase filled with flowers as a reminder of our appreciation for her commitment to our chapter. 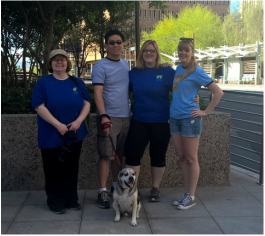 Members of the AFWA Mesa East Valley Chapter, friends and family participated in the 2016 Phoenix Heart Walk raising awareness and funds for the efforts of the American Heart Association. This year's heart walk team raised over $1000 for research and education. Thanks to team members and sponsors! Join us next year on March 18, 2017 for the 5K or 1 mile routes. The AFWA Mesa East Valley Chapter, AFWA Phoenix Chapter and IMA AZ Valley of the Sun Chapter hosted the 9th Annual Empowering Today's Accountant Seminar at the Desert Willow Conference Center in Phoenix. Attendees earned up to 8 hours of CPE on accounting updates, internal audit, income taxes, human resources, import/export compliance, public speaking and forensic accounting. 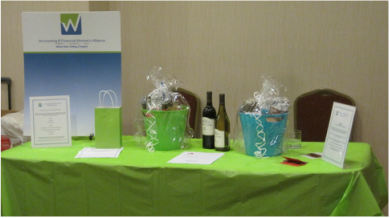 The afternoon included a raffle supporting The Foundation and the Paula Zanni Memorial Scholarship. Thank you to seminar sponsors DeVry, CliftonLarsonAllen, CBIZ, Merrymeeting Group, Arizona Office Liquidators and OutWest Publishing for their support! The Accounting & Financial Women's Alliance Mesa East Valley Chapter and the Institute of Management Accountants sponsored the 8th Annual Empowering Today's Accountant Seminar at the Holiday Inn & Suites in Mesa. Attendees earned 8 hours of CPE from a range of topics including Internal Control, Affordable Care Act, Mentoring, IRA Mistakes, Career Development, EEOC, Qualified Plans and Taxes. Thanks to Merrymeeting Group, Edward Jones and OutWest Publishing for their sponsorship of this year's event. Members of the AFWA Mesa East Valley Chapter participated in the 2013 Phoenix Heart Walk. The Number Crunchers Team raised $900 for the research and education efforts of the American Heart Association. For more information on AFWA Mesa East Valley Chapter news and events, please contact Laura Mangan.